To get the complete camper cabin manufactured or to take on the interior works on your own is not only a question of the budget. Technical comprehension, craftsmanship, methodical competence, and sufficient time are indispensible if you want to lend a hand. On the other hand you should have all that if you want to set out on a world trip. A very important point to decide on making the interior works on your own is: If you fitted everything you will know where to find what and how to repair a potential defect. As individual as the vehicle choice is the size of the camper cabin. How much time of the year will you spend in your RV, how much comfort do you need, and how little can you handle? Which use does the truck have and where is the limit for your budget? Not to restrict the off-road capability of the Unimog was decisive to us. 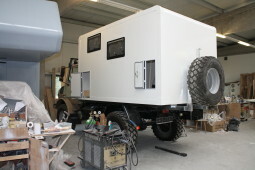 We limited the outer camper cabin’s measures to 2.25 m (7.4 ft) width and 3.5 m (11.5 ft) length. This might sound ridiculous compared to American RVs but because of that nearly no overhang arose and we could save an expensive “expedition rump”. 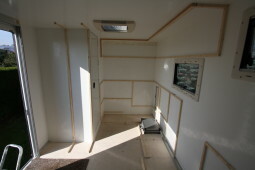 Our minimum comfort demand called for enough headroom and a self-contained bathroom with shower and lavatory. We cut out consciously a connection to the driver’s cabin. Because of the level difference the Unimog’s passage turns out a doggie door, steals interior space, is expensive, a thermal bridge, and in the long run difficult to make watertight. We’ll see during the trip if the factor of safety that would have pleaded for a connection plays a figure. 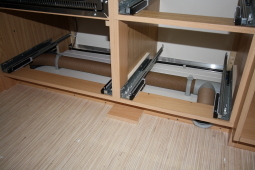 The basic framework made from strips of wood for the furniture fitting was fixed with highly effective adhesive and screws. Only after that the walls were painted. To the debit of storage space but in favor of optical appearance we decided for wall cabinets with an extensive countertop instead of tall cupboards. 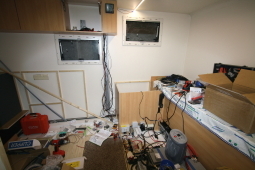 With these small cabin measures we hardly could realize a fixed double bed as we had originally planned. We confined us to a fixed single bed; together with the converted corner unit it makes a double bed. We embedded a 250 litres (66 gallons) fresh water tank with two service hatches into the front storage compartment. To prevent the water from freezing in case of sub-zero temperature the storage compartment can be optionally heated. The 80 l (21 gallons) waste water tank is located outside of the cabin for lack of space. 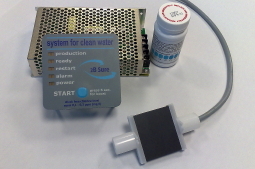 For drinking water processing we installed the environmentally friendly 2B Sure system. The electrolytic drinking water disinfection, utilized in shipping and industry for years, does without harmful chemicals and with minor power consumption. As required a direct current is driven at the push of a button between two electrodes, built into the tank. Naturally existing salts in the water are changed to oxidizing and disinfecting substances and decompose subsequently to salts again. Water, tank and pipes are kept free from all germs like bacteria, viruses, mold and algae. The diesel heating serves at the same time as boiler. If you plan to go higher up you will have to get yourself a second diesel pump designed for the respective elevation. Our standard pump works until 1500 metres altitude (4920 ft), the additional pump shall go until 2750 m sea level (9020 ft). Let’s hope that it won’t leave us in the lurch higher up. We installed a separate heater tank inside to avoid diesel gelling in case of very low temperature and failing of the heating in the most inconvenient moment. The energy concept is founded on several pillars: Two 160 Ah AGM batteries and an appropriate battery charger shape the basis. 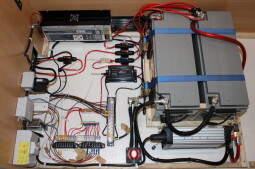 A battery-to-battery-charger secures the power supply on the run. The solar panel on the roof delivers environmentally-friendly energy. 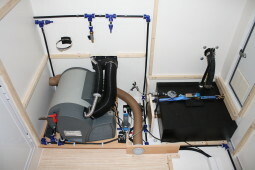 Two connections for external 220 V and 110 V AC power as well as a generator in case of need complete the system. If required a 1000/2000 W voltage converter supplies us with 220 V AC. In between chaos seized our endeavours and despair spreaded. The lightweight-construction furniture was crafted by a cabinet maker. His experience and professional equipment indemnify that visual appearance and fit exceed ordinary do-it-yourself construction. The oven cabinet was lined with heat protection foil and got a chimney outwards to carry off heat. We are tired of dull white bread eating and got years ago into the habit of baking bread ourselves. 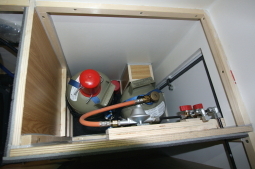 The gas cabinet has to be accessible from outside, ventilated and completely gasketed inwards. To prevent a thermal bridge to the interior we cased the compartment with 10 mm insulation foil. Thick heater tubes wriggle through under the closets. 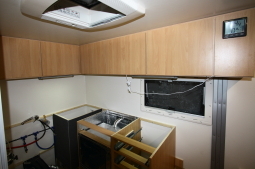 Ventilation outlets do not only lead into the camper cabin and bathroom. If required we can heat the front storage compartment so that the fresh water tank doesn’t freeze in case of severe degrees below zero. 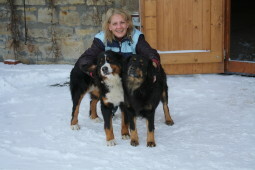 The two labour supervising office's employees Anka and Cora care for the mandatory regular breaks. They are based directly in the barn that has been placed at our disposal for finishing the cabin. It's done! Living for several years on not even seven and a half square metres (80 sq ft) - is that possible? A spacious sitting area, consisting of one integral bed, two seats and a rail mounted fol- ding table leaves also space to welcome guests in the cabin. A bookshelf carries travel guides, maps and fiction. Lowering the folding table, setting the second mattress on it and stowing the seat cushions form a lie down area of 1.4 x 2 m (4.6 x 6.6 ft). Cuddly, but spacious enough for two tall people. Due to energy efficiency reasons only LED lamps are used except in the bathroom. The closet on the bathroom wall uses the available space ideally. Despite sink and 3-flame gas stove spacious work surface remains. A baking oven, numerous drawers, and an ample refrigerator must not be missed. A window in the kitchen area cares for ventilation; at the control panel all important processes in the vessel can be moni- tored. The bathroom was given enough space to fit a separated shower cubicle, a rotatable water-closet, and a corner washbowl. The mirror bathroom cabinet with energy-saving fluorescent lamp and a lot of hooks deliver storage options. Also here a big window arranges for sufficient air ventilation.